Kenny Chesney Graces The Cover Of The June Men’s Health Magazine. 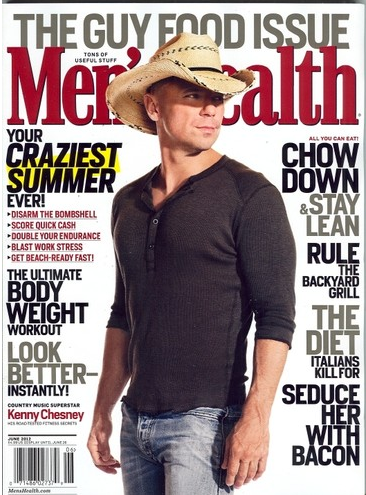 Kenny Chesney will be on the cover of June’s edition of Men’s Health magazine. Inside he shares his year-round training plan for getting through the 2-hour concerts on tour this summer for his new album, Welcome To The Fishbowl. Check Out The Cover of Men’s Health! Chesney was also named the fittest man in country last summer by Men’s Health. You can read the full story on Chesney online! You can also learn how he keeps in shape by reading about hisworkout routine! Country Music News Blog participates in advertising programs that help fund the operation of this site. For more information please visit our privacy statement. This entry was posted in Community, Featured, Kenny Chesney, News by HaleighT. Bookmark the permalink.